When my eyeballs landed on this recipe in Eating Well magazine, they blinked twice and did a back flip. I’ve got a *thing* for meatballs. Juicy inside with a meatlicious outer crust.. oooh I am powerless to resist them. Here each bite is heightened with citrus and the heavenly scent of rosemary. The sauce, both creamy, light AND decadent is infused with the same, bringing this salt-free dish to unparalleled heights of flavor. I chose my favorite white wine of the moment, Kono Sauvignon Blanc from New Zealand. Its fabulous citrus notes are the perfect partner to the sauce as well as dinner itself. Don’t have fresh herbs? Use dried. Don’t care for rosemary? Try thyme instead. Or do like I did and use both! Served with extra wide egg noodles, drizzled liberally with the sauce, it’s a low sodium dieter’s dream. 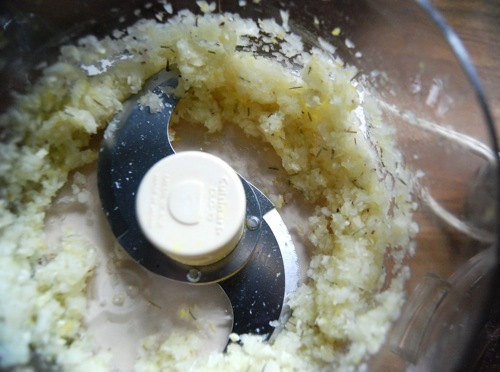 Place onion, garlic and lemon zest in a food processor. Add 1 tablespoon fresh or 1 teaspoon dried rosemary and pulse until the mixture is finely chopped but NOT mushy. Transfer mixture to a large bowl and using your (freshly washed) hands, add in the turkey, breadcrumbs, Parmesan and pepper, mixing until combined. Pinch off 2 tablespoons at a time and shape into meatballs, each about 1 1/2 inches in diameter. 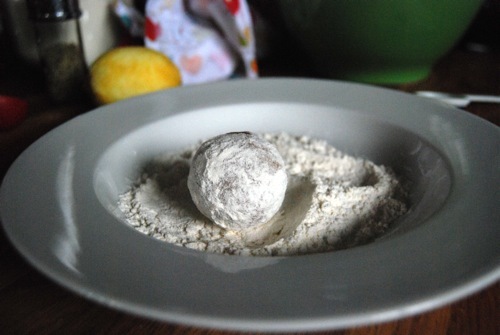 Place flour in a shallow dish and roll the meatballs to lightly coat. Reserve the remaining flour. Heat oil in a large skillet over medium heat. 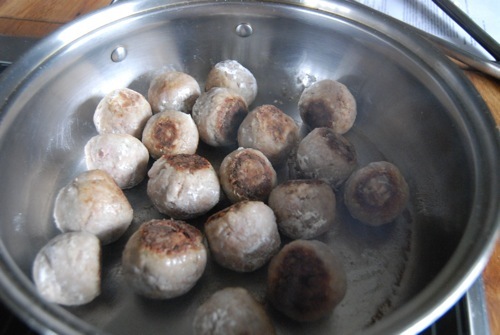 Once oil is hot, add meatballs and cook, turning once or twice, until browned, about 5 minutes. 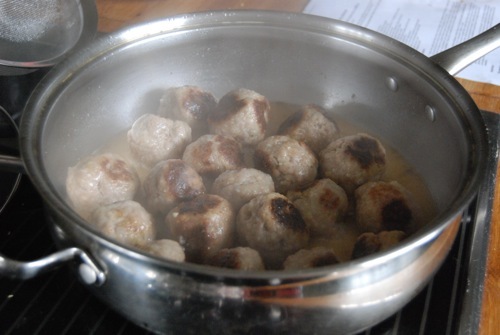 Remove the meatballs from the pan, place on a plate and set aside. Add wine to the pan, increase heat to medium-high and cook, scraping up any browned bits, until almost evaporated, about a minute. Add the broth and bring to a boil. Reduce heat to maintain a simmer and return the meatballs to the pan along with the remaining rosemary. Cover and cook until the meatballs are no longer pink in the middle, about 10 minutes. 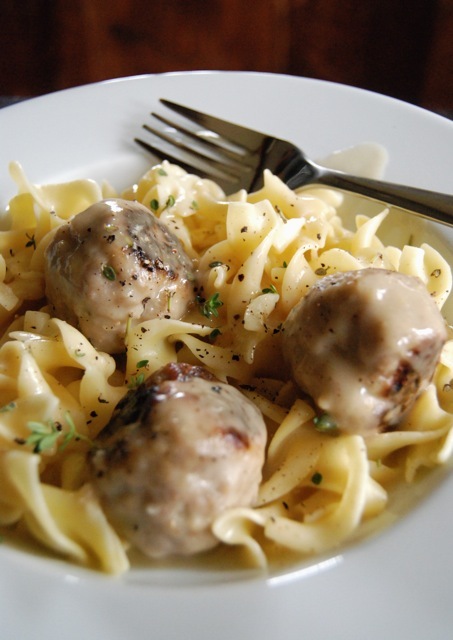 Remove the meatballs to a plate and set aside. Bring the sauce to a boil over medium-high and cook until reduced to 1 cup. Whisk lemon juice and 1 tablespoon of the reserved flour in a small bowl, mixing until smooth. Add the flour mixture to the sauce along with butter. Simmer, whisking constantly, until slightly thickened. 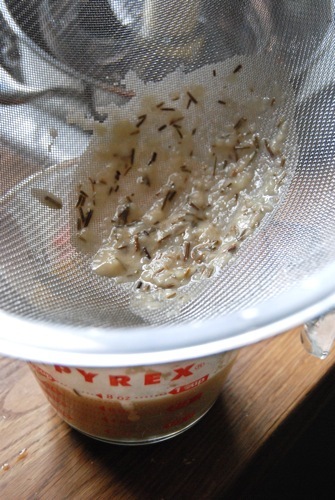 Strain sauce through a fine-mesh sieve. Serve immediately, garnishing each plate with fresh herbs and freshly ground black pepper to taste. This entry was posted in Main Dishes and tagged Eating Well, Kono Sauvignon Blanc. Bookmark the permalink. ohhhh! those meatballs look delish! and flouring a meatball? never heard of it but i bet it gives them a nice crispy crust! Nat – TRY THESE!! I know you are “additive suspicious” but really, you will love them. Such a bright combination of flavors, nothing to throw you off – they’re delicious! PS: THANK YOU SO MUCH FOR THE POSTCARD!!!! Just got it, so happy! I’d like to sample this dish with two forks at once… would that be rude?! Seriously, every time I watch that show “American’s Next Great Restaurant”, I’m like, “I don’t CARE if the meatball guy is a bad businessman with poor taste and you don’t want to make him your partner. I NEED to be able to buy meatballs every day!” Nevermind that there’s already an all-meatball restaurant here that I’ve only been to once. These look woooooonderful, especially with all of that black pepper. Absolutely love meatballs, so I’ll have to try the recipe. 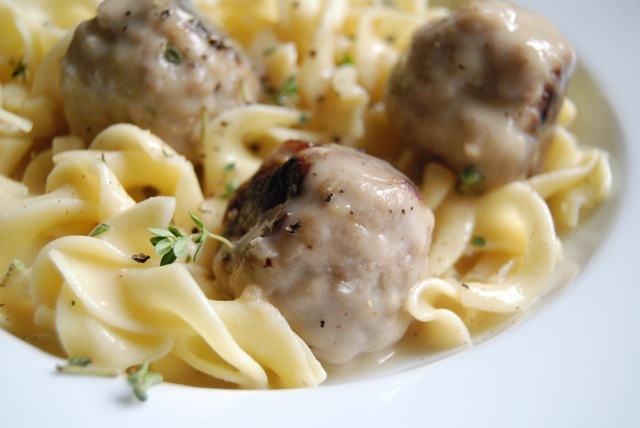 My biggest problem with meatballs is that I want to eat enough for three people. Inky, as long as you’re not sharing the same plate as me – we are FINE! Katie, I too love love love the meatballs & the pepper!